I met Ian at Armidale’s Regional Gallery, during my residency in Walcha. We sat in a quiet corner of the Gallery (in the gallery Café that was closed to the public that day). He had kindly brought with him a selection of his plein-air desert paintings. AP (contemplating the paintings): These small works are very luminous…. Yes, these are the sort of colours you get when you are working outside. There is something about the way you’re mixing, you create colours that you can’t get in your studio…. In the studio there is always a sense of……you are always conscious. Whereas when you are out there, you are no more conscious. You are working purely from your subconscious,you are having a dialogue. It is that dialogue that you get lost in and that makes the work so interesting. And you work a lot quicker. AP: you don’t have time to waste …. the light is changing all the time…. You know, it’s like in the studio: just one more cup of coffee…. Well, I am working towards an exhibition in Sydney, in March, and it a bit unusual for me because all my work has been in our house which I haven’t had access to for 2 years. ..I have quite a lot of pictures that are unfinished and I haven’t seen in a while, and I am looking forward to see them again. In a way it is quite nice to have a 2 years break from something! That is going to be a new experience (seeing them again): I remember some of the colours, introducing gold in some of them. It will be interesting to see whether it stands up… whether it’s got merit or not. A friend of mine has taken over the head of Pupunya, and Pupunya has been such an important place for me as a start of the aboriginal art movement that I would really love to go there. But if it doesn’t happen this year it can happen next year. AP: Would it be the first time that you went? Yes I have never been to Papunya. I have been to Alice spring and the McDonald ranges. So going back in the desert is what I am about to do. I am going to the same place: I have been sitting in the same place for 10 years. I know it sounds weird but in this vast place, it gives me a way into the landscape again. Yes, It gets me home, allowing me to find my place in the vast landscape. I do other things: something stops me along the road and I stop the car and start painting, obviously, but the idea of going to the same place, you know, it is never really exactly the same: It might be three or four weeks later or earlier than it was last year, and it had rained so it is a totally different experience to when two years before it had a drought! It is not the same place: the only thing that is the same if the structure, and that is what I am trying to use: the structure of the landscape. Certain things in the landscape I become familiar with. So, I can build up, I can work quickly, and it starts making sense. …yes, the dialogue. It is a dialogue with time, if you like, that is exactly what it is: a dialogue with time. I’ve always used water-based mediums. But I think this might change…. I think I would like going back working with oils again. I haven’t worked with oils in a long long time, mainly because I have been working large (in the studio). If I work too large in oils, I loose myself. Oils seem to have a point where, if you go any further you can easily mess up. It is unmanageable with my process. And it takes far too much time. When I am out in the desert I tend to go out there for 10-12 days. [..] Many times I have been doing this also with students from the Australian national University. There is a research station at Lake Mungo. The two places I have been going are far west NSW: Lake Mungo and Kinchega National Park which is south of Broken Hill, once or twice a year. The first pictures I did were actually made in Sydney after a first experience with the landscape at Uluru. About a year later I was working in a small the studio, I had these two big canvases and I remember I couldn’t stand back from them very far, only about a meter. I painted them in 6 weeks or so. The first picture I did was purchased by the Gallery of Western Australia, and the second won the Wynne prize. So it is interesting that there two first paintings were so crucial to my young career getting me into two state galleries. AJ: They were seminal works from a career perspective but also from a practice perspective as you must have felt you had “touched” onto something? I got a lot of feedback about this work, including from artists such as Peter Sharp who I didn’t know personally at the time, and he told me this painting changed his life, changed his direction. And then two years later I won again, with a totally different painting! I think there was quite a bit of luck involved in that, I think? I look at the second painting which is quite a tough painting, compared to the first that is more “Iconic”…..….. I seem to have a skill at making “iconic paintings” (smiling)….I don’t mean that in a pretentious way, but the thing that gives that is that I don’t work towards an I image. I am just ….experiencing the journey of making something. One of my favorite sayings of Picasso, and it is something he said that some people thought was arrogant….. like what I just said about my “iconic” painting…. (smiling again)….he said “ I don’t search, I find”. So I am into that journey until I find…. What is it, in that image that makes you stop? AJ: you use watercolour? Acrylic? I prepare all papers and my boards and gesso-ed front and back, I take a stack of them. I did some big ones out, at Kinchega. The National park gave me room, and it was the first time that I was able to work there on large paintings, in the landscape, and that was a fantastic experience. I find that what I captured there….. [pausing]…. In fact the first painting I did there got me the Country Energy Prize and that painting was made at Kinchega. AP: so, when out there, you work in series? AP: ??? you work…. ??? In eights…numbers of eight. I have never been able to paint a ninth. EVER. Ninth always f***s up! I think it has to do with symmetry. I am an “eight” anyway. That’s my number… but I think it has to do with symmetry….and how I work with it. I have all the board around me; I start working on all eight (waving his hand around as if brushing the boards spread out on the floor). And then eventually one will start and say “I want a bit more than that” so then I start giving it a bit more, and then the next one says “where is my bit”, so then by the time you are finished you have 8 works bubbling along quite nicely. You are right! That is exactly right, I am actually exhausted, I can’t do nine…never been able to do it! It’s interesting, isn’t it? And if I happen to work on bigger paintings, it’s four. AJ: you use photographic material? AP: then you take these to the studio. Do you work from these or do you start off something totally different in the studio? I work on something completely different. I work with dots. I’ve never tried to reproduce a painting ever, it doesn’t work for me. I think going out there puts my head and my body into a different space, and then I need to re-process, to interpret the information. …. well, I did a few of those also in the studio so it is not quite true but….I’ve enjoyed dotting and mark making as another way of interpreting space. AP and there are no figures..
No figures. I’ve learned very easily that I am not a figure painter …and neither was Turner…and he ruined many great paintings by putting in a stupid figure. So I learned pretty quickly keep the figure out! ….Well the person looking at the work IS the figure, for me. That for me is the figure in the landscape. If there was a figure in the painting you would be looking at a figure looking at you! A friend of mine said “I really like your paintings, I get lost in it”… that was a really nice thing to say. I like the idea of someone getting lost in my painting. It is that experience of moving through. I am kind of moving away from it now, actually. I’ve had a show at QVB called “Degrees of abstraction”. Abstraction has always been a great love of mine. One of my favorite painters is Mark Rothko. When I was a student in London I used to go to look at his paintings for hours on end. I want to move away from this (pointing to the small-scale works) and I think that the dotting is really helping with that because I am dealing with an abstract thing. 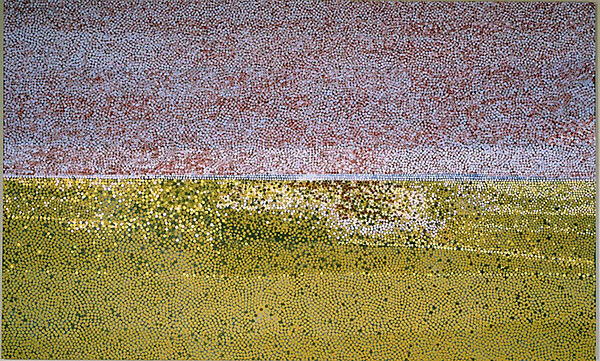 A lot of people had a lot of hard time with that (the dots), saying I was borrowing from aboriginal art…. For Christ sake! Look at my work: it that aboriginal? I don’t think so. Would an aboriginal person look at my work and say “that is painted by an aboriginal?” I don’t think so. I think it’s moved a long way since I first used them. I had them in 2001-2002 in my studio, the first ones I did…. I was born in Yorkshire, in a small town, but my grandparents had a farm. So everything, my love of the country, came from that. My mother had lost three children, ten years before me. My family was in a bit of tension when I was born so I was sent to my grandparents a lot and thought it was great. That gave me the freedom and the love. Walking through the landscape, through the country, with my dog, when I was feeling a bit down, a bit depressed, would help me get better. I have always loved the idea of getting lost in the landscape, travelling through. The physical thing of walking has something therapeutic, making me feel connected. So yes, I was going to either be a farmer, or an artist, but my grandparents gave up the farm so… I went to art school. I went to Bradford art school (where David Hockey went), then to London to do my honors degree. I remember David Hockney saying a lovely thing. He said: “you can take everything away from me but you won’t get Yorkshire”. It is kind of like me, I’ve always had a special place called Yorkshire. Yorkshire is very beautiful, very powerful, very open. There is not many trees, in that way it is almost like the desert, very strong. It was Turner’s favourite landscape. Turner loved it. One of his main supporters named Fawkes had a big country house near a Seaton and so he knew it very well and painted it. It [Yorkshire] leaves a print. Where ever you go you carry it with you. …. I don’t think Spain ever left Picasso. You look at Picasso and he is Spanish. Even though he created most of his art in France, they are still Spanish paintings. You can’t get rid of that. There is just that “grrrrrr” [frowning]…when you go to a Spanish museum and look at historical Spanish paintings, you come out of there shaking! They were frightening. And with Picasso it’s still there. AP: How old were you when you arrived in Australia? I was 22 or 23. I came here because I had met someone, but I was always going to come to Australia. I had a great love of Aboriginal culture which I don’t know where it came from…. When I was 13 or 14 I wrote on the history of Australia and the Aborigines for my school. And I just feel that for some reason I had a connection with the Aboriginal culture, but I don’t know where it came from. I didn’t know what there were then until I came here. I know what they are now. They are Churingas, Aboriginal sacred stones…. But I got it then. They talked to me straight away, I didn’t need any introduction, I just knew. When I thought about it at the time, they reminded me of Celtic spirals. There was another connection, with my [own] history! I have also an interest in Celtic culture. To me there was this incredible link between my Celtic history and these Aboriginal stones. I didn’t know what it was but I knew it was powerful. BESIDES ENGLAND AND AUSTRALIA, HAVE YOU TRAVELED & USED OVERSEAS LANDSCAPE AS A SOURCE OF INSPIRATION? I found that experience beautiful. I love the whole idea of Buddhism, a philosophy instead of a religion, it sounds to me like a pretty good idea…. and I used to visit temples in the morning, and I find it a really cleansing experience, just to be in that presence. AP: it is more a ”spiritual experience” rather than a special landscape? It is more the whole cultural aspect I am looking for. I love that culture. I love the food; there is a sort of gentleness about the Thai. It is possibly the most easiest place to travel to in Asia. There is no confrontation; it just doesn’t happen unless you have done something bad. They are so accommodating! I have done some pieces there: I have done some Rice Paintings. The technique of using the dots translated perfectly to rice fields and when I showed them in Thailand they got it straight away. I found it was a good way to move away from the Aboriginal connection, taking it to another culture. AP: my next question was going to be DO YOU HAVE A SPECIAL CONNECTION TO THE AUSTRALIAN LANDSCAPE? But my feeling now, from listening to you is that you are travelling a spiritual journey, rather than a journey into the landscape, so this is not specifically attached to the Australian experience. The landscape seems only a way to explore the spiritual? And maybe what you appreciate so much in the Aboriginal ways is the spirituality? Yes, absolutely…I think that it is absolutely true and that’s why I can’t reproduce these things in the studio (pointing to the small desert plein-air works on the table in front of us), it would be like reproducing a… a ritual. You have to take a ritual and re-interpret when you come back to the city. You can’t reproduce the same experience, back in the city. AP: So moving into abstraction allows you to do that, become purely spiritual, rather than representing? Look at where the rain is falling out of that cloud, now that is so beautiful that little transition…. It would be so difficult to reproduce that in the studio. It would be totally senseless. Why I do these, while I will always do them in fact, even if I do end up painting abstraction only in connection to the land, is because they give me that sense of detail, which I can then interpret. It’s a bit like Matisse when he puts everything in and then takes everything out. It is the same process, the same idea of refinement. When I was teaching I used to say to students: “to finish this work it is not about adding in, it’s taking away”… and 99.9% of the time that’s true. It’s always taking something out. Yes… I feel like I had a very long apprenticeship! I think maybe because I didn’t….well when I went to art school I studied sculpture. I still make sculpture but only a couple of pieces of year. YOU MENTIONED YOUR LOVE OF ROTHKO’s WORK…IS THERE OTHER ARTISTS THAT YOU LIKE AND MAY HAVE INFLUENCED YOUR OWN WORK? Turner was my first love, very spiritual works. I am a great fan of Albert Namatjira. In his time there was a lot of stupid politics about Albert painting in the “white style” but really if you have knowledge about what Albert was painting, they were all his Dreaming sites, all the things he was responsible for. It was not the idea of painting any mountain, it was HIS mountain. And I thing that it is what made his paintings so interesting and special. Also he was the first Aboriginal artist to show Aboriginal people that they could be respected for something that was theirs and that was their property, their language, their dreaming. So I see him as a real giant, as a figure….apart from being an exquisite painter. I can’t think of a watercolorist better than him. He just created the greatest watercolours that’ve ever turned up in my books. Aboriginal art has had the greatest influence on me over the last 20yrs or so, really, and the two artist that somehow lead me there are Tony Tuckson and Ian Fairweather, two artists I really love. I think what Fairweather was kind of the first artist who really got to understand what it was about to work in Asia. He kind of got all that culture together in that time in China. And he is kind of …. focused in such a way …. there is a spiritual quality about his work because they look like stained-glass windows…. there’s a lot of that thing in Fairwether that I love. ….and then obviously I like some Fred Williams, I think he’s great. …… but in some others I think he’s rubbish. When Fred is good he’s driven. There is an American artist named Terry Winters in New York that I like very much, he layers things and there is a sort of organic quality of his work… I like his work. 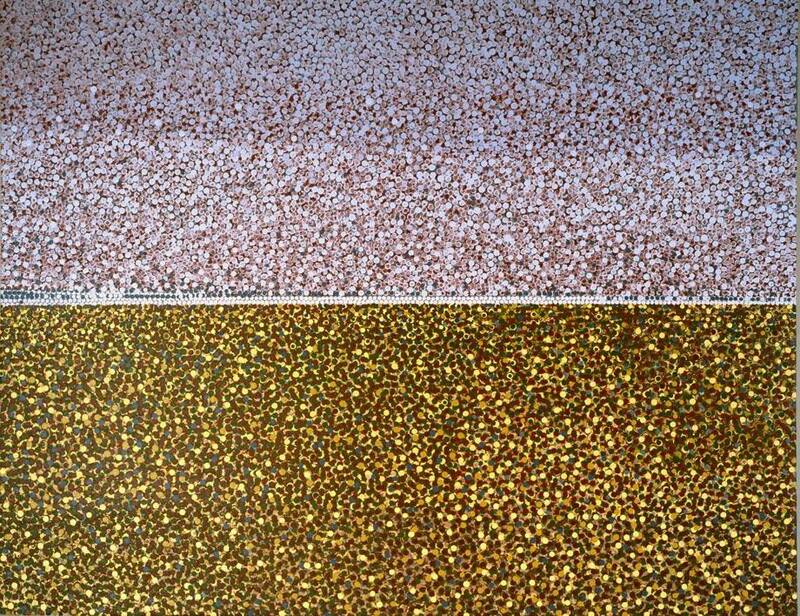 I think there are a lot of contemporary artists that are great… but my biggest influence over the past 20yrs has really been aboriginal art! ….I think …. We‘ve mentioned before it sorts of brings in me a spiritual dimension…. Particularly when you work in a large landscape like the desert, you are working with the void and I just love that feeling when you are in a desert, and I’m sure that it must happen also with the sea…the idea of the end of the sky, being dissolved, …..you become …. like an empty space, in that way…. I like that sense of ….non materialism. Nothing about the landscape has been made by a human being. It is primordial in a sense, still as it was. It’s changing, but…I think that freedom from materialism is pointing to spiritualism for me. AP: it is underlining Buddhism as well. A friend of mine said, “If I was going there I’d be confronting the void”, and I said, that it’s why I go. It’s exactly that. I go to confront the void. John Burgess is one of my favourite writers….he’s been in France where he worked on several books, on several novels but in the last few years he’s gone back into art writing. He wrote a beautiful essay called “A professional secret” where he talks about an energy that grows between the subject and the person who scrutinizes that subject and I think he is right: I think that what happens when you work on something like this, you capture an energy. Now, it is a very, sort of ”hippy” thing to do, to talk about energy sometimes……but when I stay in Kinchega it’s not just a dry “art material”: I am experiencing energy, I am experiencing thought patterns, I am experiencing, as I go through that painting and look how I made it, I feel like I am having almost an experience out of painting. It makes me feel a sort of wellness that way, it does feel amazing. I think that is why I make work, it makes me feel good… you unburden this energy. I have always loved the music, and I’d love to be a musician but I always think: After a gig it must be so sad in the morning when that energy is gone! Whereas I wake up and just need to look again. And then I do it again. That’s the magic of it. So you come back to Sydney with these little jewels [pointing to the small paintings], you’re coming back with 50, or 80 or 150 little jewels in the back of your truck. And there is something really magic about that, that I can look back and remember exactly where I did that, right at that moment and the thoughts I was having at the time of doing it. That is why also music can be beautiful, because music is energy. Music has that wonderful way of taking you on a journey too, and it is not just sound, it is almost a journey of energy, the fluidity of it. When I was doing that show at Queen Vitoria Building, I asked Peter Sculthorpe if he would open it. See, I never work on the whole thing, I’m not interested in the whole thing….. All I’m interested in is that bit there, that bit there…one bit at a time. When I got that box worked out, I do the next box. And that means also that one box inspires you to the next box. That’s the most beautiful thing. If that box is really working, you want that next bit to work. That’s the logic of the whole work.